Water is a source of growing tension and violence in places it is scarce. At the same time, sea level rise and flooding threaten millions of people living near coastlines and low-lying areas. Traditional infrastructure such as concrete dams and seawalls is insufficient to protect people from these multiplying threats. Natural or green infrastructure can harness elements like forests, flood plains, wetlands, soils and mangroves to enhance water supply, flood management, hydropower and irrigation. For example, vegetation and pervious soils can slow rising tides and hold water in one place for better management. The economic, social and environmental benefits of using green infrastructure have been documented in many cases, including in Europe, China and the United States. More than 20 percent of Vietnam’s population live in the Mekong Delta, and most of them are reliant on rice farming and shrimp aquaculture. Mangrove forests protect residents of the Mekong Delta against erosion and flooding, but the mangroves have rapidly declined over time, in part due to the pressures of shrimp farming and urbanization. Sea level rise threatens highly populated areas in the Mekong Delta. The map below shows areas that would be flooded by 1.5 meters of sea level rise, a level seas could rise by 2100 if emissions aren’t curtailed. The sea level rise data are from Climate Central, and population data are from the European Commission Joint Research Centre. Mangroves can also be seen on this map (provided by the United Nations Environment Program), though smaller-scale mangrove restoration projects are not represented. Traditional coastal protection methods use sea dikes, artificial walls built using rocks or concrete. Recent research indicates that these walls may increase flooding elsewhere and disrupt coastal ecosystems. But a new project harnesses the coastal protection functions of mangroves in combination with sea dikes. Mangrove protection measures also have the potential to benefit farmers by protecting aquaculture operations from erosion and salt water intrusion. The Vietnam Mekong Delta Climate Resiliency and Sustainable Livelihood Project has encouraged local farmers to shift from intensive shrimp farming to methods that incorporate mangroves. These methods also allow farmers to apply for international certification as sustainable seafood farmers. Washington, D.C.’s sewer system is more than 100 years old. When there’s excess sewage and stormwater draining into the system, it flows directly into local waterways, which harms local ecosystems. Expansions of asphalt pavement and buildings from increased urbanization in recent decades have exacerbated this issue. Data on the extent of impervious surfaces from NASA’s Socioeconomic Data and Applications Center are shown on Resource Watch below. In the early 2000s, excess stormwater was flowing into waterways in such high volumes and frequency that Washington was in violation of the U.S. Clean Water Act and the U.S. Environmental Protection Agency’s (EPA) pollutant regulations. In 2005, the city crafted a $2.6 billion plan with the EPA to develop infrastructure that would remediate the stormwater issues, including three deep tunnels under the Anacostia, Potomac and Rock Creek watersheds. To incentivize investment in natural infrastructure, the city water authority set up a $25 million-dollar bond to reduce the financial risk associated with green infrastructure projects. The bond will reward investors if green infrastructure performs well and limit financial risk to the water authority if the project underperforms. The pilot project uses the bond to fund green infrastructure improvements in the Rock Creek watershed, such as rain gardens, green roofs and green spaces. After construction is completed this year, DC Water will be monitoring the results to see if water retention increases, which could eliminate the need for a deep tunnel. If successful, the project could be used as an example of how other municipalities could minimize the risk and maximize the benefits of investing in green infrastructure. Colombo is the financial hub of Sri Lanka. It’s undergone rapid urban development in recent decades, sometimes at the expense of wetlands that protect the city from flooding. Colombo’s surrounding metro area represents about half of the national GDP. Over the past 10 years, water-holding capacity of wetlands surrounding the city has decreased 40 percent, which puts the region and nation in economic risk from flooding and sea level rise. According to the World Bank, if Colombo lost all of its wetlands, the metro region would risk losing an average of 1 percent of GDP each year due to flood damage. 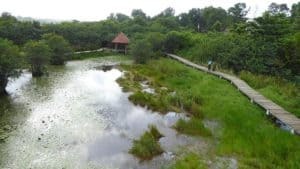 The Metro Colombo Urban Development Project, funded by World Bank and partners, has identified 2,000 hectares of wetlands as important for water-holding capacity for Colombo. The project established the city’s first urban wetland park, Beddegana, 18 hectares of wetland that provides important habitat for plants and animals while cooling surrounding areas. This service is important because the built-up nature of the metro area makes it 1 degree Celsius hotter in the summer than surrounding areas, according to data from the Center for International Earth Science Information Network. Costa Rica is paying landowners directly to conserve and restore forests. These measures can reduce sedimentation of reservoirs and restore the health of the country’s hydropower infrastructure. The country went through a major period of deforestation in the 1980s. Forest loss led to increased soil erosion and sedimentation in reservoirs, which threatened the country’s hydropower, which supplies three-quarters of national demand. In 1996, Costa Rica’s Ministry of Environment and Energy set up a payment for ecosystem services program to pay landowners to protect and restore forests. From 1996 to the end of 2017, landowners signed more than 17,000 contracts encompassing 280,000 hectares. According to the World Bank, about half of Costa Rica’s land is now covered by forest, compared to just 26 percent in 1983. The map below shows tree cover and tree cover gain data from Global Forest Watch and Hydropower plants from the Global Power Plant Database. Read the full report on integrating green and gray infrastructure at WRI.